Sautéed green beans with garlic butter is an easy ten minute side dish! Serve it for a weeknight dinner or a special occasion. 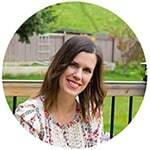 With Easter just around the corner, it’s got me thinking about easy, spring-y dishes. And these sautéed green beans with garlic butter totally fit the bill! 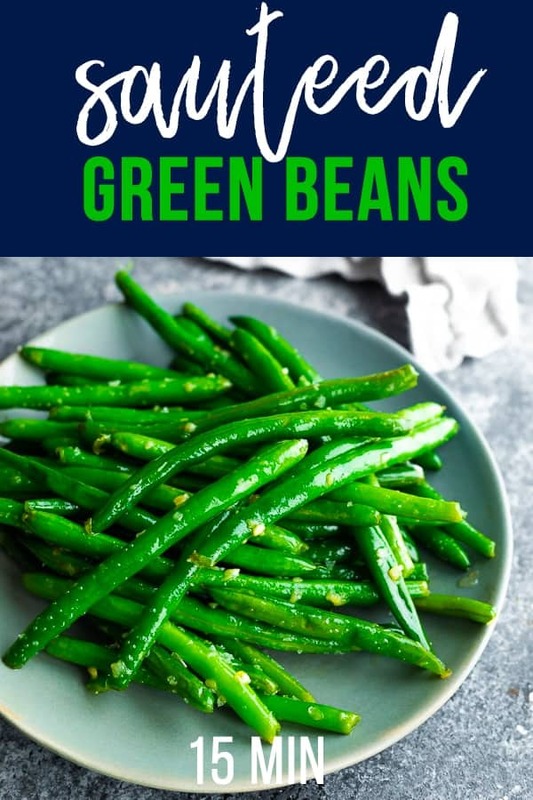 I know I’m always looking for easy side dishes, and these green beans are SO easy. One pan, 10 minutes and 4 ingredients. That’s it! Honestly, I know sometimes I go out to left field with some crazy recipes, but it’s always comforting to come back to classic flavors. 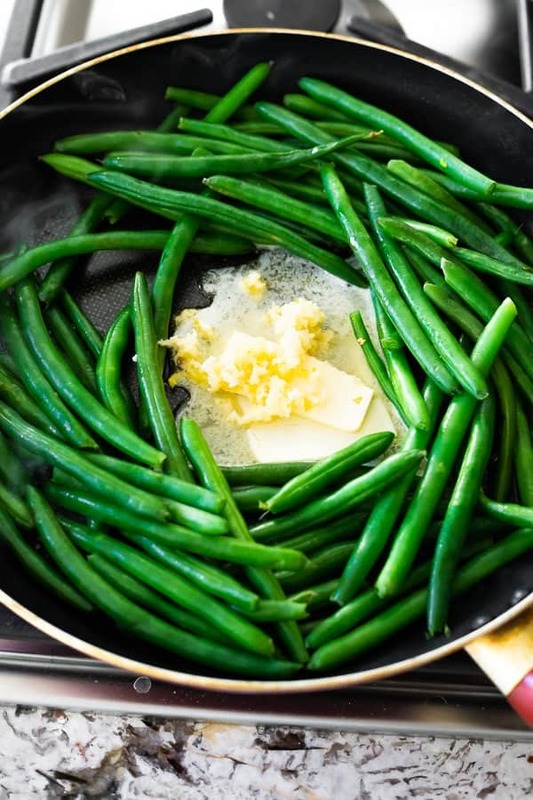 Green beans, butter and garlic is a combination you just can’t go wrong with! they are simple, classic, and delicious! In order to make sure you end up with perfect, tender, green beans, we first steam them. If you don’t have a covered pan, you can do this step in a pot! 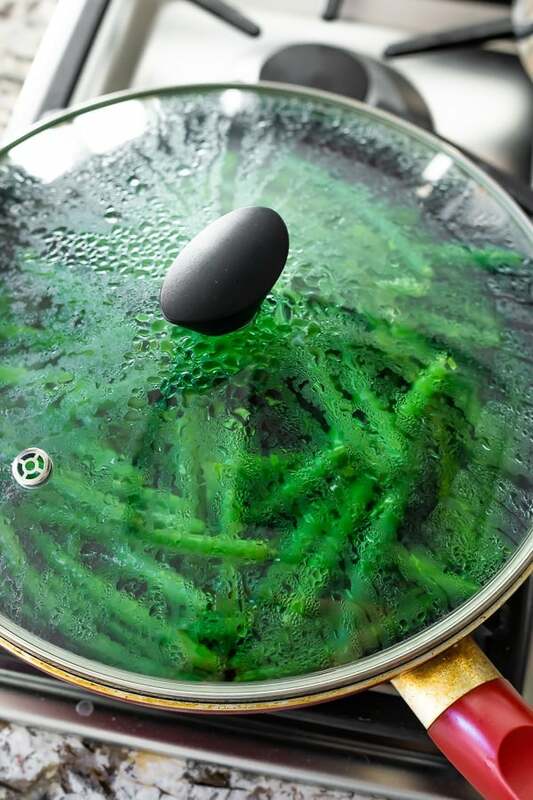 Add green beans and 1/4 cup of water to a pan. Uncover. If the water has absorbed, add the butter right away. If there’s a bit of water left, simmer uncovered for 1 minute. Make a space in the middle of the pan. Add the butter & garlic, and cook for 1 minute. 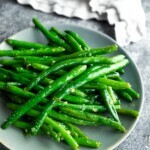 Toss green beans in the butter/garlic, then season with flaky sea salt. 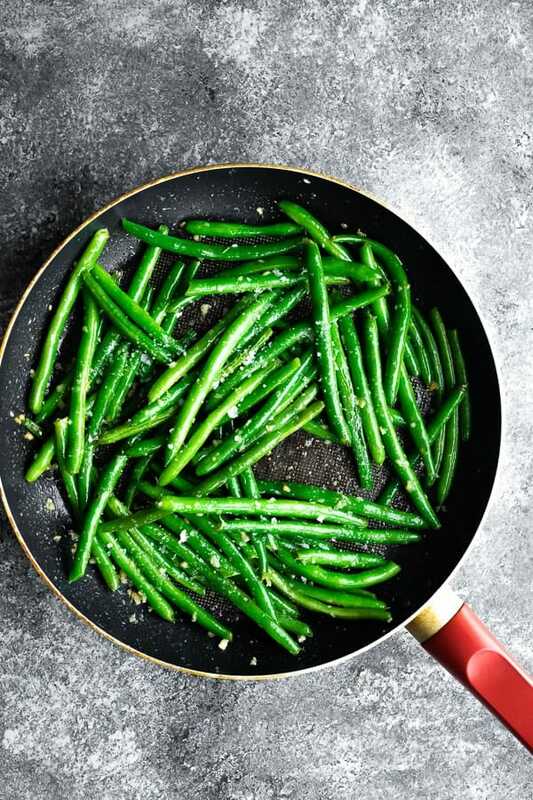 Can I make this sauteed green beans recipe using frozen green beans? Unfortunately, this recipe requires fresh green beans. Frozen will end up mushy. I recommend saving frozen green beans for soups or skillet recipes where it’s OK to have softer textures. Can I make this sauteed green beans recipe vegan? Sure, you could swap the butter for coconut oil (or olive oil). Adjust the salt if needed. 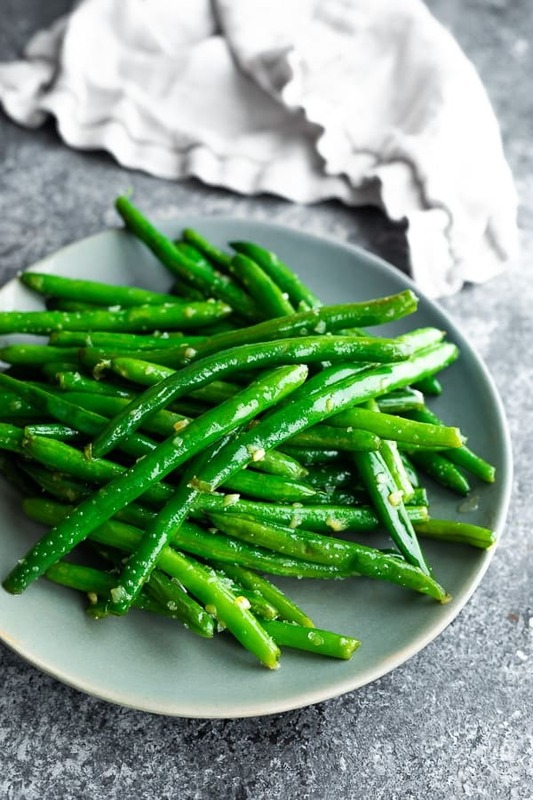 Can I use these sauteed green beans with garlic for meal prep? Leftovers keep, and are great re-heated. The beans do lose their ‘crunch’ a bit but they are still delicious. What should I serve with sauteed fresh green beans? I have a ton of recipes that would go great with sauteed fresh green beans! 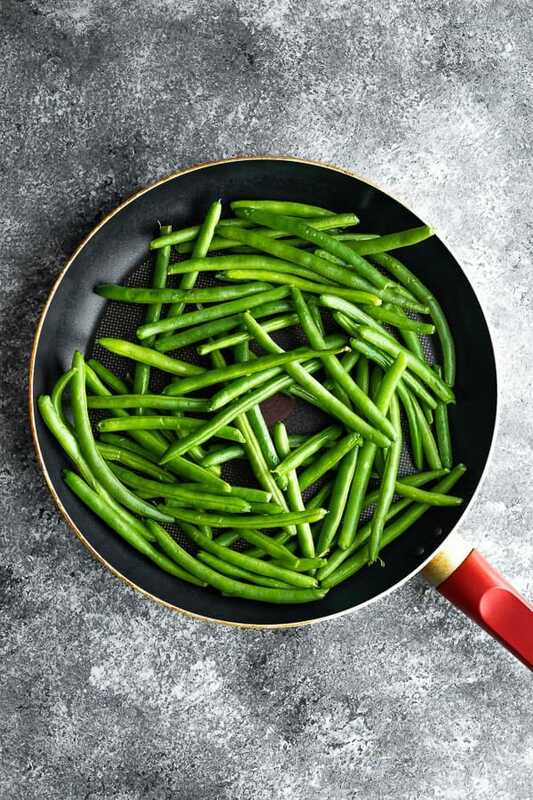 Add green beans and water to a 12-inch pan and cover with a lid. Bring to a simmer, reduce heat and keep at a simmer for 3 minutes. Remove the lid. If all water has evaporated, add butter and garlic right away. If there is still liquid in the pan, simmer uncovered for 1 minute to evaporate it off. Make a space in the middle of the green beans. Add the butter and garlic and allow garlic to cook in the butter for at least 1 minute, or until starting to turn golden. Toss beans in garlic and butter. Sprinkle with flaky sea salt. **if you don't have flaky sea salt, start with a few pinches of table salt. Taste and add more as needed.